This is the second blog inspired by my visit to colleagues at National Library of Australia, last August. The first, discusses a federated approach to better incorporating custom signatures into the PRONOM signature base without modifying PRONOM. The essence of the blog, however, still centers around how the community can create signatures for itself, and make use of those, while The National Archives focuses on its own work and release larger PRONOM updates as frequently as it needs to. The first blog in the series links to guidance to help users understand and create a basic signature for a file-format that DROID can recognize so we won’t go over that ground again here. What we will cover is the concept, and creation, of a container signature – a mechanism for identifying, with greater precision, the contents of container file formats based on ZIP or OLE2 containers – the most popular examples include early Microsoft Office formats, often found in OLE2 containers, and then later (post-2007) Microsoft Office formats, now often found in ZIP containers. Container identification works largely the same way as standard format identification, but also enables the identification of paths within containers if a byte sequence (magic number) does not exist or cannot be divined from a sample of objects. For DROID’s sake, the filename is encoded with the date it was created as a unique ID and to enable sorting within its preferences dialog and to allow users to select from different files if using an alternative to the default. While PRONOM does model the earliest form of DROID signature, it is converted into a DROID compatible signature file before it is used in the tool – I often call this DROID byte code. The output is a single file that indexes the PRONOM corpus and the converted byte codes. For a container file to be identified a reference to it must exist in the standard signature file, this will normally be in the form of a title/description, file format extension, and a PRONOM unique identifier (PUID). Providing those exist, similar data will be repeated in the container signature file, partially for documentation purposes, but also partially linking the two models together. The majority of work will be done in linking the two mechanisms through the trigger PUIDs. As the earlier flow chart describes, once a PUID triggers container identification, DROID passes the byte stream as input to the container identification mechanism – if a match is discovered the canonical reference information in PRONOM will be returned to the user through the DROID user interface. Trying to find the balance in this blog between too much detail on the mechanics, and practical guidance that will help users, I will use the remainder to describe what you need to do to create your own container signatures in the hope that it will help to boost community development of PRONOM data. I have created two templates to make that easier on GitHub here: https://github.com/exponential-decay/droid-signature-files/tree/master/signature-file-templates. Simply edit the commented out parts of the signature files to begin creating your own container signature. Aside from the container type, the other important pieces of information I have specified are the structure (folders and files), and two byte sequences that make up the content of the files. We will ask DROID to match the sample file based on being a ZIP based container, with a *.OPF extension, containing all the folders specified and all the byte sequences within the files specified. Within a container signature you can match both file paths and internal byte sequences of files. We can define a byte sequence using standard PRONOM signature syntax. We will use both of these techniques. 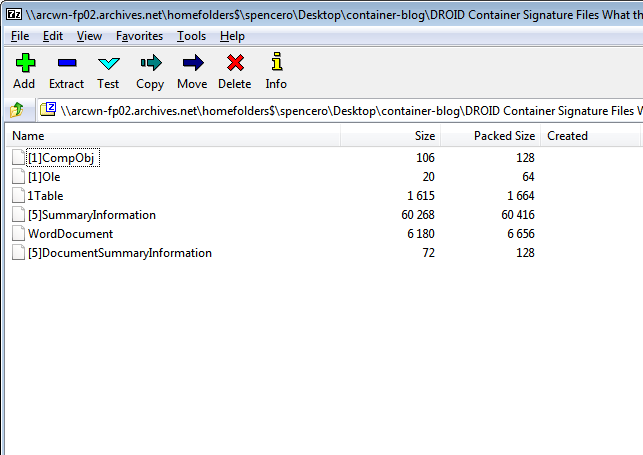 Within the .droid6 folder, before running DROID with the new signature files in place, I will also delete the folders ‘profile_templates’ and ‘profiles’. This will ensure that when DROID loads it will re-build the signature definitions correctly – extensive testing and re-testing of signatures can often confuse DROID at this point. Start with simple byte sequences in container signatures and then increase complexity. The more detailed the expression the more issues and potential bugs you may uncover. Pushing the system will be useful, but I do recommend making your signatures work first and then optimizing. To understand container signatures more, it is a good idea to look at the most recent index provided by The National Archives, UK, based on date, above: 17 December 2015. This will give you a good idea about the techniques and standards The National Archives, UK, adopts. You can also see my basic container signatures here: https://github.com/exponential-decay/droid-signature-files. There is a mix of OLE2 signatures here and ZIP based signatures too, they will likely grow overtime. These may provide a good start for you to get into container development. How do you begin custom development? I recommend trying to download the samples from my GitHub, reviewing the documentation here as a tutorial, reviewing the contents of the XML, and trying to observe the structure of the sample file. I’d then recommend trying to get them to work in conjunction with your version of DROID so that you can see how DROID puts everything together and how further development might practically work for you. The example described can be manipulated easily for ZIP based objects but OLE2 objects work, and can be viewed in much the same way. 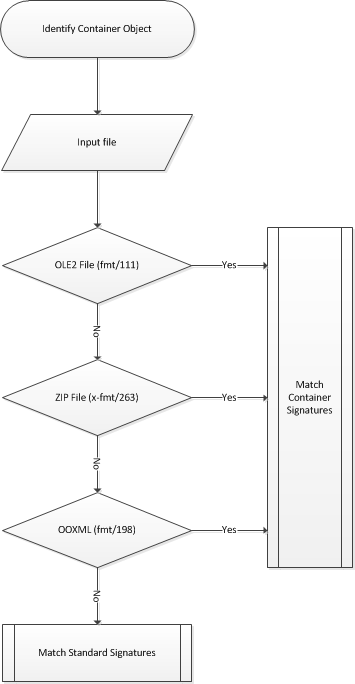 Once you’ve a candidate set of files you want to create a signature from a tool such as 7-ZIP can be used to extract the structure from the object, the tool working with OLE2 much like a zip object. 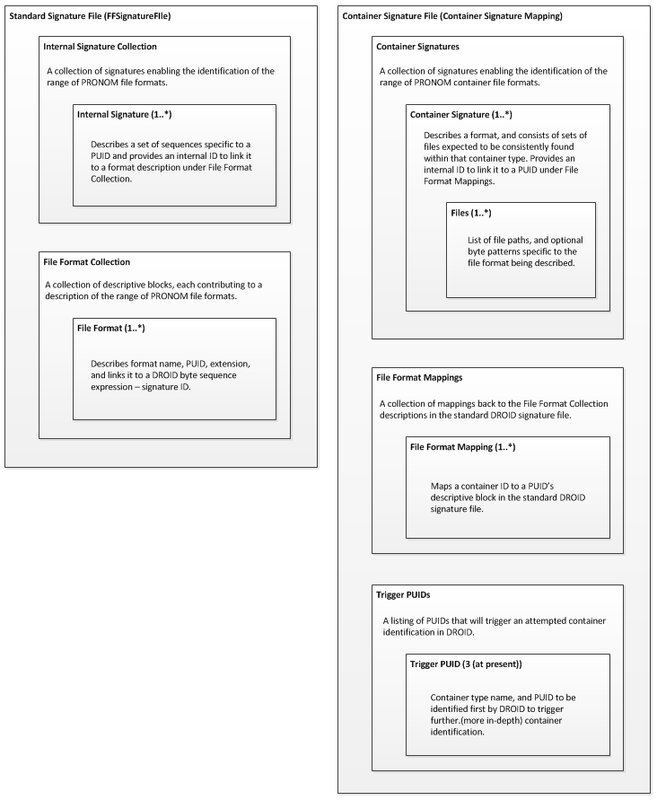 The directory listing and byte sequence specification for DROID will look exactly the same. 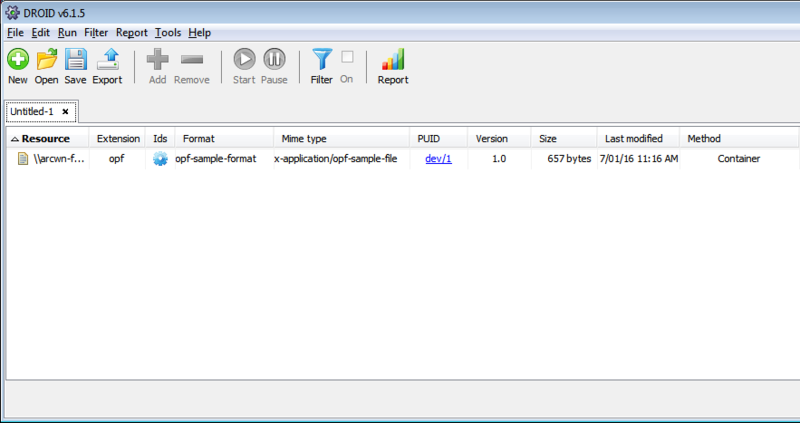 It can sometimes help to make a working copy of a file and rename it with a .ZIP extension to be able to open it easier. The top sequence belongs to OLE2, the second, to ZIP. 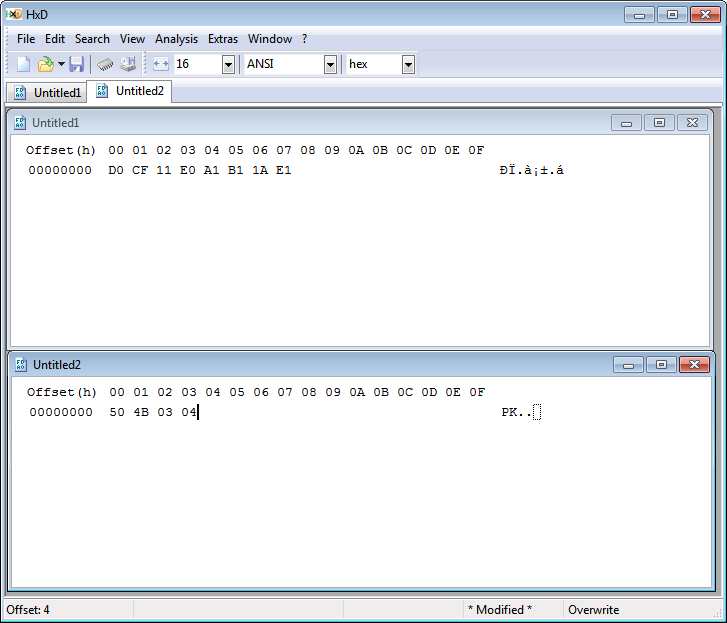 Without a hex editor, if your file is identified as fmt/111 or x-fmt/263 in DROID, but you were expecting confirmation of a different format then this will be a cue for further analysis within a hex editor and with tools other than DROID. Once you’ve started to look at the files you can start to spot the patterns that DROID will need to understand to identify your files moving forward. The Google Group droid-list is my first stop for talking about new signatures, and pronom@nationalarchives.gov.uk is my next stop for submitting draft/nearly final versions of signature to The National Archives, UK. In the complimentary blog to this, I discuss a mechanism offered by Siegfried’s helper tool Roy that enables the combination of signatures from multiple sources. Right now, with DROID, we have two options, test signatures in isolation, as we are doing above, or manipulate both official releases of signature file by hand to incorporate our additions. I’d recommend the former for one-off testing – I’d recommend Siegfried for more complex testing and given enough confidence in development, potential production use within your own system. I haven’t been able to find time to rework and extend my signature development utility to incorporate container signatures – but then – it is not clear yet that the community requires it. As a first step, until then, or The National Archives offer their own tools, I hope I’ve managed to describe the creation of container signature files adequately enough to see a little more community development. In combination with my first blog, we may see the appearance of a useful (temporary?) federated approach using Siegfried and hopefully DROID that doesn’t necessarily require PRONOM – mechanisms that enable us to make use of signatures and community signature file extensions sooner and taking some of the work demands away from The National Archives, UK, to validate community submissions. If not, the increased number of submissions to The National Archives, and increased numbers of developers will undoubtedly strengthen the code data at the heart of PRONOM. If my descriptions above are not clear enough or useful enough then please leave your feedback in the comments and I’ll seek to clarify as much as possible and add more detail, e.g. to GitHub and my tools, as much as I can. And please, anyone with greater knowledge of some of these mechanisms, leave your comments too and we can add to the information base above, correcting anything as appropriate. Let’s push container signature development further.